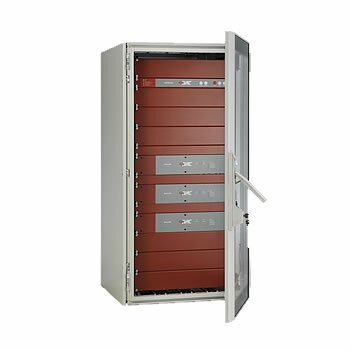 Since its launch in 2015, 4EVAC LoopDrive’s Fault Isolator Modules (FIM) has set a new market precedent. Exceeding sales predictions by 200%, the LoopDrive (FIM) system’s success is down to its flexible design, easy operation and cost effectiveness. Adding peace of mind to any 2- wire, return-loop systems design, LoopDrive (FIM) detects when the DC voltage drops below a threshold on the loop circuit and instantly isolates the fault preventing further damage. FIM protects the loop’s integrity against any open wire-to-wire short circuits, giving peace of mind that voice evacuation audio transmission will be not be interrupted. The LoopDrive Booster (LDB) is at the heart of the 4EVAC LoopDrive system. Driving up to 200 FIM’s over a dual-core cable. A single LDB can pass 800 W of audio signal from an amplifier whilst channelling DC to the loop for powering and managing the FIM modules. Easy to control and navigate with front buttons and indicators, the LoopDrive Booster gives quick access to the functions and features of the systems’ design. 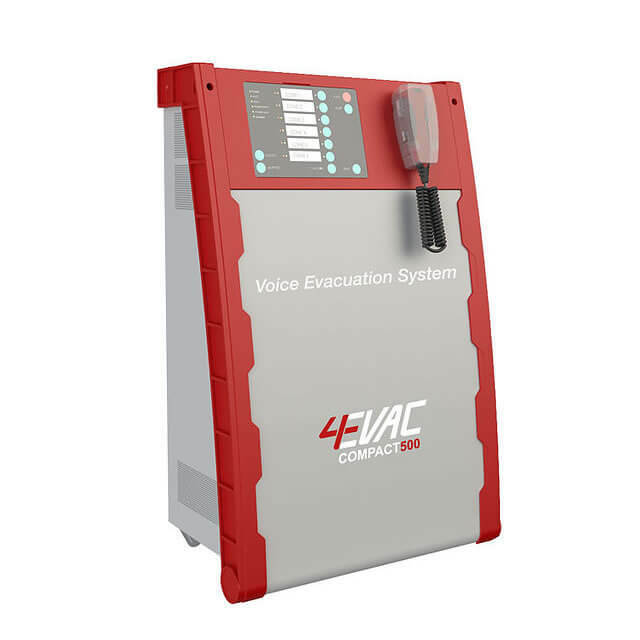 Further enhancing flexible operation, 4EVAC LoopDrive SNIFFER, is a comprehensive Graphical User Interface (GUI), which allows up to 256 LDB-units over a single RS485 connection to be easily visualised, configured, installed, managed and controlled remotely. 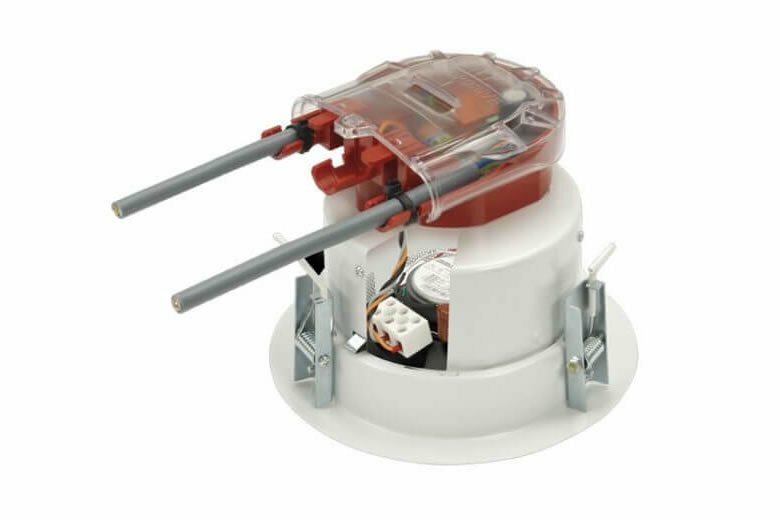 The Loopdrive Voice Alarm System Fault Isolator Module (FIM) is the successor in our range of loudspeaker loop-isolator devices that are using our patent technology to deliver a higher level of availability of evacuation loudspeaker lines that are installed according to the return-loop principle. A loudspeaker failure in a faulty section between any two FIM’s in the loop is automatically detected and isolated in order to ensure maximum availability of the remaining loudspeakers on that same loop. The FIM protects the loop integrity against any open and wire-to-wire short circuits. Evacuation signal is broadcast in the zone. Loopdrive Voice Alarm System is in quiescent mode. A maximum of 200 isolators are guarding over the audio-transmission path. All zones are broadcasting the evacuation signal. The audio-transmission path is affected by the hazard. Broadcast is interrupted, people are confused and do not know where to go to. 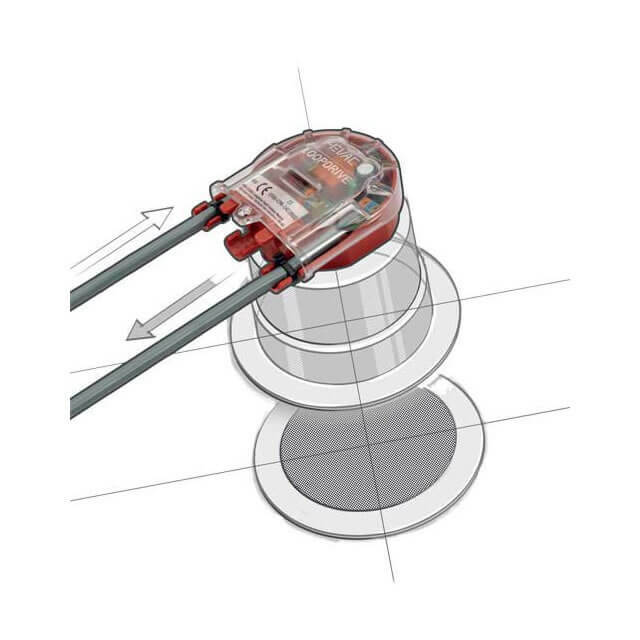 All isolators take immediate action by isolating from the transmission path and start measuring to locate and isolate the hazard. In less than 4 seconds the hazard has been detected and isolated from the transmission path. Broadcast continues. 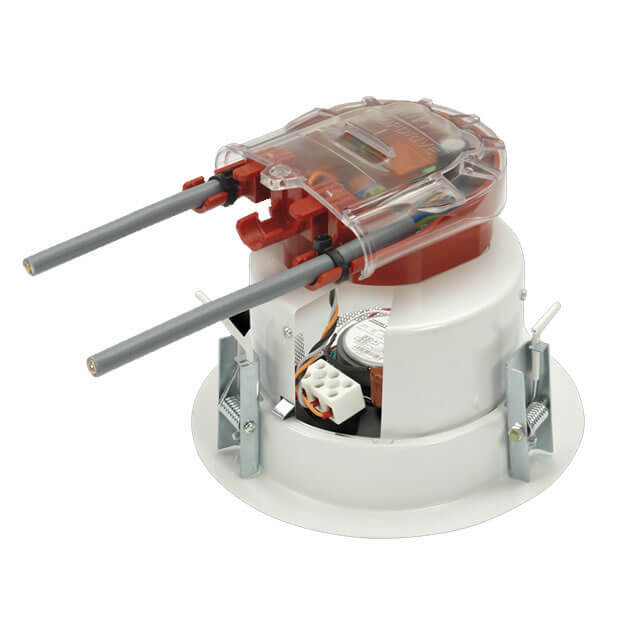 The Loopdrive Voice Alarm System Fault Isolator Module automatically opens circuit when the DC-voltage carrier drops below threshold on loop. Fault Isolator Modules (FIM) should be spaced between groups of loudspeakers (maximum 25, please refer to your national standards organisation for detailed information) in a loop to protect the rest of the loop. If an open or a short occurs between any two isolators, then both isolators immediately switch to an open circuit state and isolate the faulty group of loudspeakers between them. The remaining isolators, the T-branch loudspeakers of the affected FIM’s and the loudspeakers on the loop remain fully operational. During fault status, the Loopdrive Booster, LDB, is feeding both loop-branches simultaneously and the fault is indicated by the status LED’s on both FIM’s and LDB’s. The LED indicator(s) on the FIM and LDB are flashing with intervals to indicate the error. The FIM restores the faulty partition of the Loop-branch-lines to normal condition when the short or open circuit condition is removed and a general reset command is given by pressing the RESET button on the corresponding LDB. 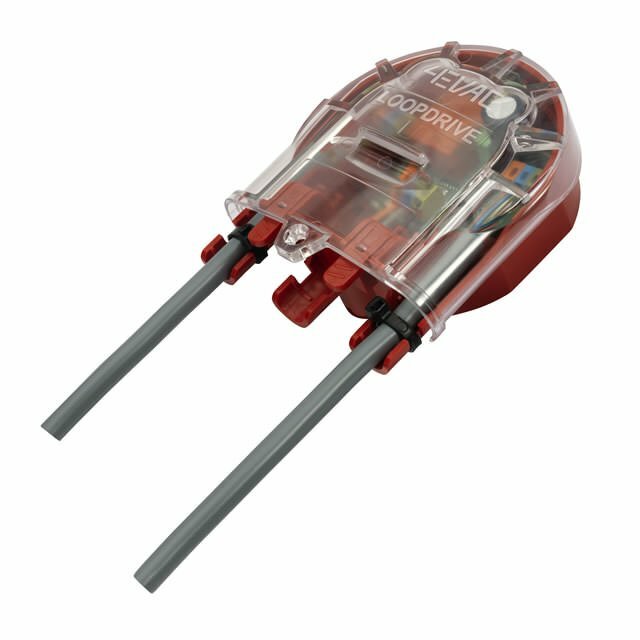 The FIM is equipped with a power capacitor that is charged by the LDB and has enough capacity to run at least two measurement cycles without the need for re-charging.